Is your baby teething and putting everything in his mouth? If so, you may want to take a look at our best teething toys. Babies literally put anything in their mouth so baby teething toys are a great way to keep their mouths busy. You need to be careful though because some toys contain chemicals that are harmful to your little one. But don’t worry! The baby teethers that we have compiled are safe and non-toxic teethers. Now that 2019 has past, here is a list of the 20 best baby teethers 2019.
Who doesn’t love a healthy banana? This is one of the best-selling teethers and is designed for babies 3 to 12 months old. Not only does this toothbrush teether provide relief to your little one’s gums, but it also helps your little one develop healthy oral habits early, preventing cavities later. Made in the USA, this infant toothbrush is safer than hard plastic toothbrushes. Its thick and soft silicone bristles help to massage sore teething gums. It’s small enough so you can easily carry it in your diaper bag. This banana teether is dishwasher and freezer friendly. It is also available in different colors, such as blue and pink. Sophie La Girafe is one of the most popular teething toys. This unique design has two rings that have different textures and surfaces for your baby to choose from based on his age and preference. 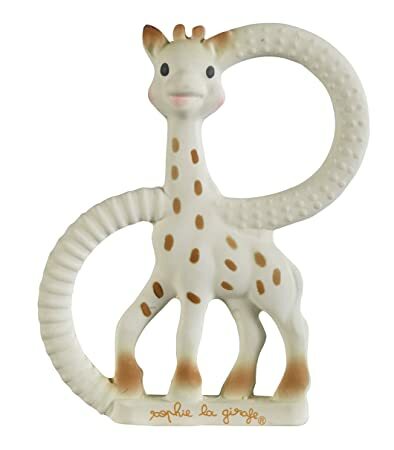 This sophie the giraffe teether is made from 100% natural rubber. When your child is past the teething stage, you can add this y to his play animal collection to make this toy last even longer. Is your baby always putting his hands in his mouth? Are you tired of picking up the teether every time your baby drops it? 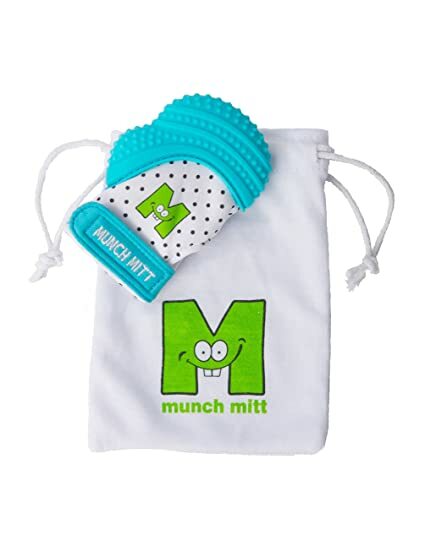 These teething mittens are a “handy” solution to your problems! Just put these gloves on your baby and not only will they comfort your baby’s teething pain, but it will also keep him safe from scratching themselves. 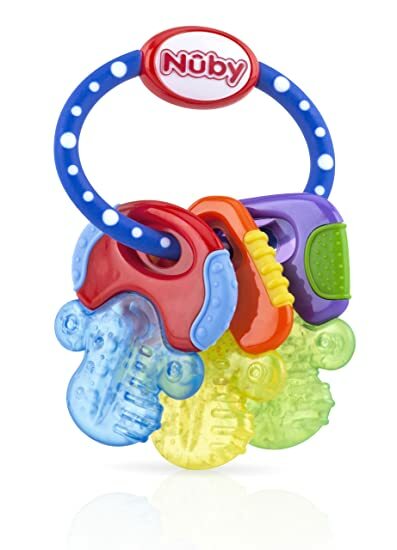 This highly rated baby teether allows your baby easy access to a teether, especially in the early stages when he is unable to grasp a standard teether for long periods. It has an adjustable velcro strap so it is made to fit your baby’s hands. It is also interchangeable so he can wear it on either hand. The teething gloves are available in different colors, including aqua blue, green, purple, and pink. There is a mini size for early teethers in yellow color. Are you still looking for one of the best teething toys for 3 month old? Look no further as this colorful set of baby keys has multiple textures and surfaces, great for providing your child relief to his gums. It has an easy grip design, which is great for little hands, and helps with coordination. He can shake this keys teether as great exercise and keep busy! What’s great about this SweeTooth teether is its unique design. Its soft ice cream and firm cone offers multiple teething textures and surfaces, making it one of the best teething toys for infants. 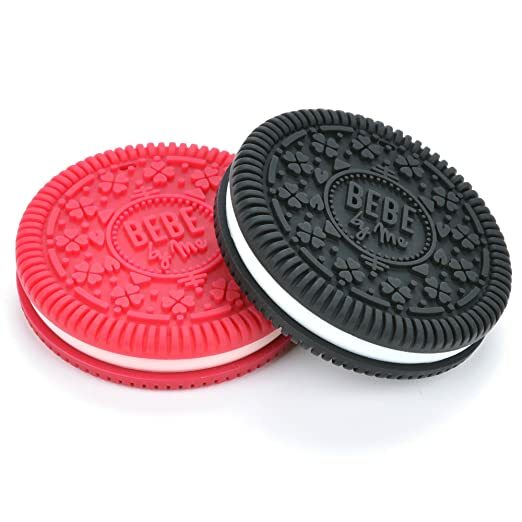 This allows your baby to choose their bite resistance based on their teething stage. You can put it in the dishwasher or freezer for a cooling sensation. When your child is past the teething stage, you can add this ice cream cone to his play food collection to make this toy last even longer. Great for babies with a sweet tooth! 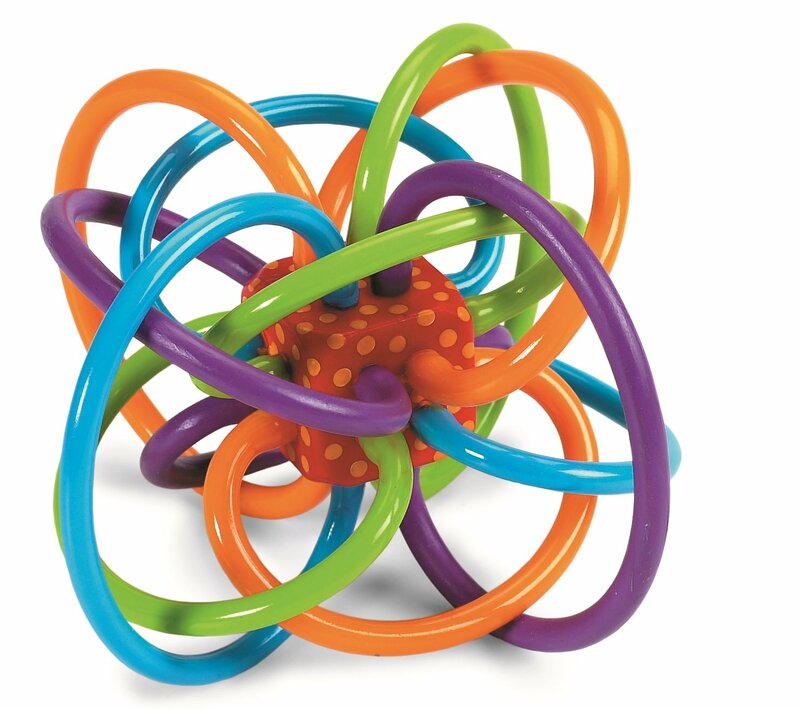 This mesmerizing maze of colorful and continuous tubes is perfect teething toy to keep your baby busy. This Manhattan Toy teether promotes clutching and two-handed play. The middle cube has a rattle sound so your little one can shake it like a rattle. It’s lightweight and its continuous loop design makes it easy for your little one to grab, hold and rattle. You can put this in the fridge for a more soothing experience for sore baby gums and teeth. This soft silicone fish-shaped teether has multiple teething surfaces. It’s the perfect size and shape for your baby to hold, making it one of best teething toys for babies. The teether comes with a hygienic carrying case to keep the it clean when your baby is not using it. This way, you can easily throw it in your diaper bag without having to worry about it getting dirty! Does your baby love to chomp on his fingers? This baby teether is perfect for him! 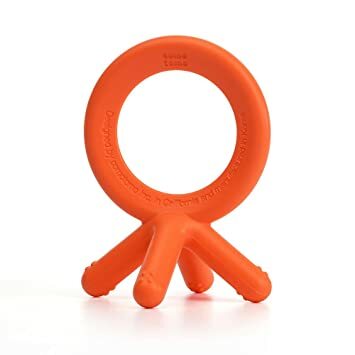 This silicone teether is the perfect size to hold and the design mimics baby fingers, making it one of the best baby teethers. It features a unique non-choking design and multiple grabbing and biting points. This popular teether toy is safe in boiling water. microwaves, dishwashers, and sterilizers so you can easily sanitize it! This adorable Infantino Squeeze and Teethe lion teether is soft and flexible. This natural rubber toy has malleable edges, which make great surfaces in soothing your baby’s pain. 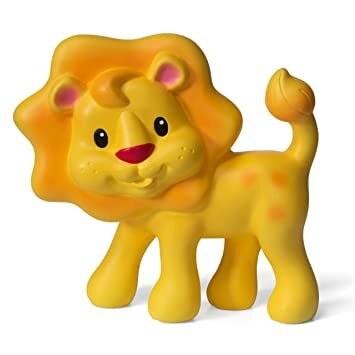 When your child is past the teething stage, you can add this lion to his play animal collection and engage in imaginative play. Infantino also has other animal teethers, such as a lamb teether and a cow teether. 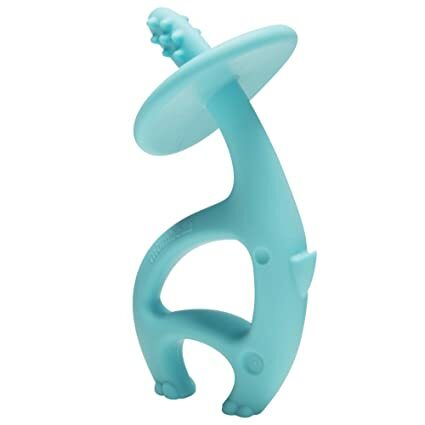 This elephant teether features a unique, non-choking design that is easy for your baby to grasp and maneuver. The nubs at the top are great for vigorous gumming and emerging teeth. Safety 1st also makes Ollie Octopus Teether and Mimi Mushroom Teether. Is it a stuffed animal or a teether? 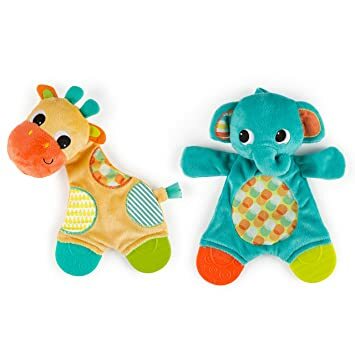 Bright Starts has these cute, soft, high quality plushes that have teethable feet. The feet help to soothe your little one’s aching gums. These animal teethers are great for comforting and soothing your baby. They feature a crinkle sound, which is a great distraction from their discomfort. You can either get a giraffe and elephant. Both have soft fabrics! There is also a loop on the back so you can attach it to a car seat, stroller, or diaper bag. Get your little one started early on veggies! This silicone teether is safe for baby and features food-safe coloring. Little Toader has other cute teething toy designs, such as this mushroom teether, carrot teether, and pineapple teether. 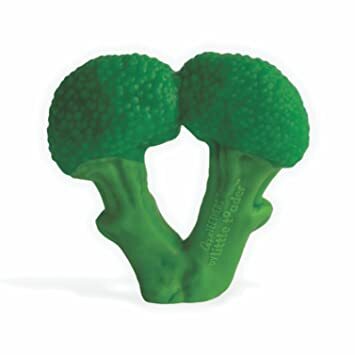 Best of all, when your baby is past the teething stage, you can add this broccoli to his play food collection and encourage imaginative play. Not only is this chew toy one of the best teething products, but you can also use it as a toothbrush. 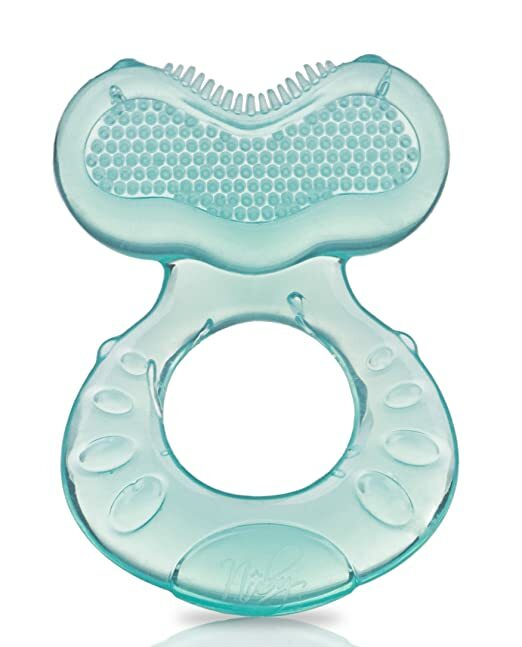 The Zoli teether has a textured tip that soothes your baby’s gums. The nubs and wide handle are perfect for introducing a toothbrush to your baby. It has an anti-choke shield and easy-to-grip handle, great for little hands. Bonus: It comes in a pack of 2! This Nuby teether features multiple teething surfaces and textures that help to massage your baby’s gums. Its circular shape makes it easy for babies to grip. It’s small enough to add it to your diaper bag checklist. The teether has bright colors and different characters to keep your baby’s eyes busy! This Baby Einstein teether is perfect for little princesses! 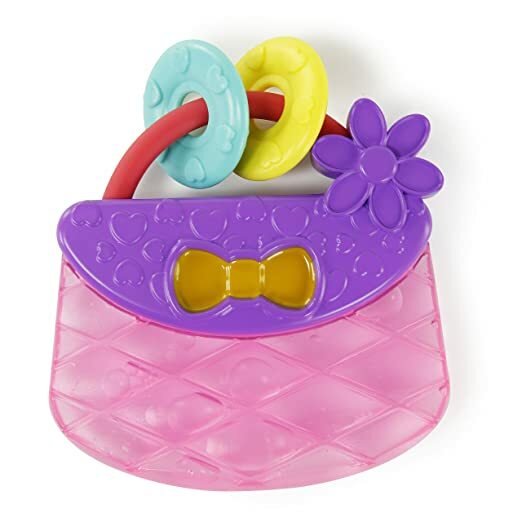 This purse teether is water-filled and safe. 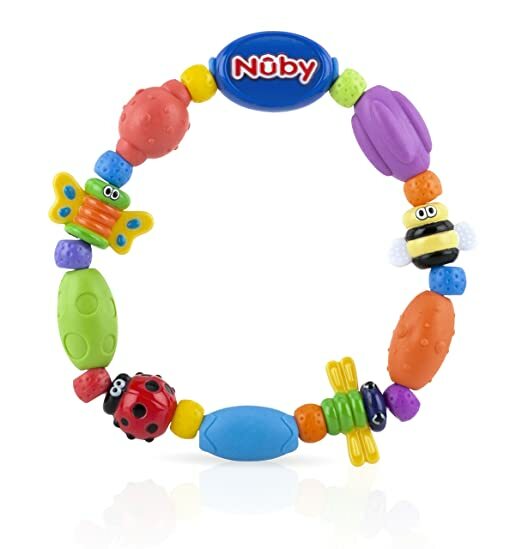 As one of the best teething remedies, this teether soothes your baby’s gums and is easy to grip. By purchasing this product, you are supporting the pink power mom program, benefiting breast cancer charities globally! The Ashtonbee teethers come in a set of 5! What a deal! Made of 100% medical grade silicone, these teethers fit snugly in your baby’s mouth and are just the right size so you don’t have to worry about them being choking hazards. Each of the 5 teethers has a unique design and surface texture that massages your infant’s gums to relieve teething pains. They all have a wide handle so your baby can grip them easily. If he gets bored of one of the teethers, he still has 4 more to choose from! Your baby has a sweet tooth craving? These sandwich cookie teethers are perfect to keep your little one’s mouth busy! There is a hard chocolate teether and a soft and chewy raspberry teether. Both are made out of high-end medical grade silicone and have a unique floral pattern. Each cookie has a different texture and a chewiness level to soothe sensitive gums. It includes 2 detachable cords that parents can use to attach to strollers or baby carriers. The cords need to be removed if teethers are used without parents’ supervision. 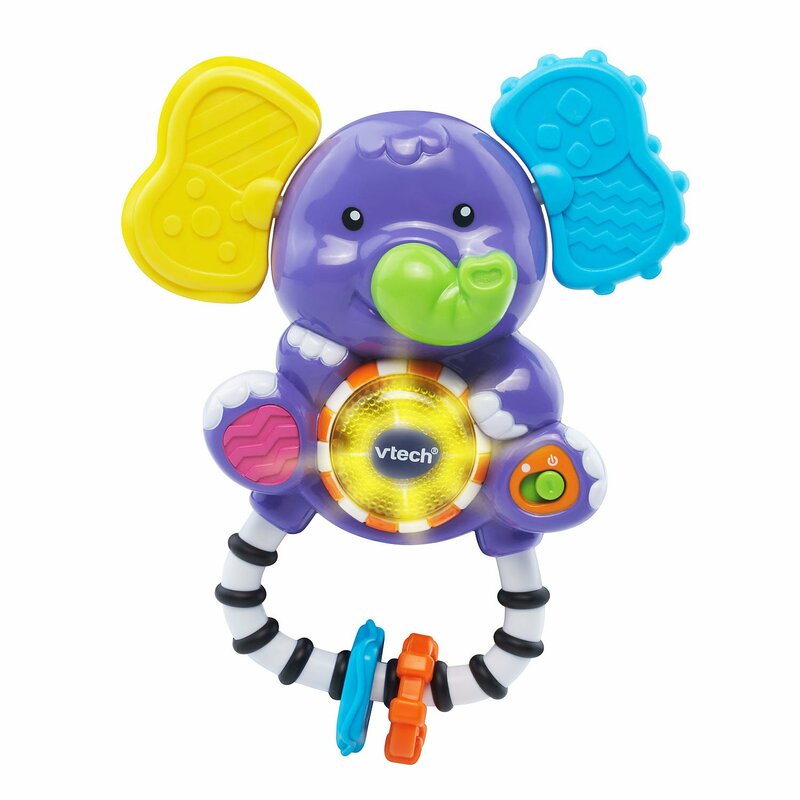 This interactive toy by Vtech is both a rattle and a teether. Shaking the baby rattle, and turning the elephant’s trunks and ears will cause the toy to make sounds. The rattle plays over 25 songs, sounds, and phrases. The elephant’s soft ears are perfect for teething and soothing your little one’s sore gums. Made in the USA, these silicone teethers have 4 different sections to develop oral motor skills. The different ribs and nubs are fun for your baby to explore and keep them busy. 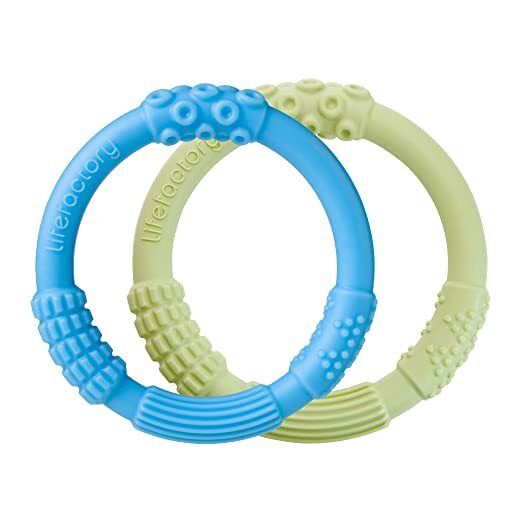 These teething rings for babies are lightweight and soft, easy for your little one to hold. You can refrigerate or freeze them to soothe aching gums. Best of all, your baby can wear it as a bracelet so that it is always nearby. They come in a set of 2 teethers, one in blue and one in green. Who doesn’t love Minnie and Mickey? 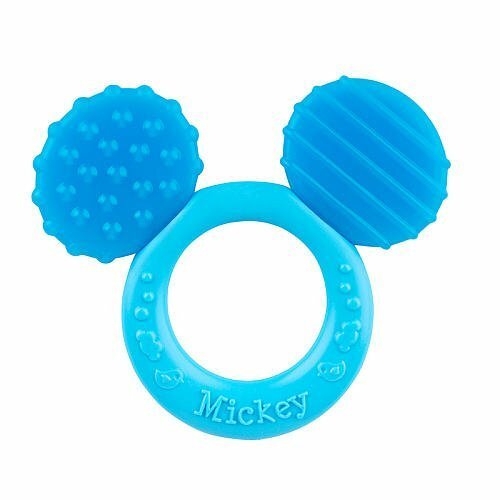 These cute Disney Teethers by Nuk have multi-textured surfaces that soothe aching gums. They are amongst the top natural teething toys, made with natural BPA-free rubber. You can place these teethers in the fridge for extra cooling relief. 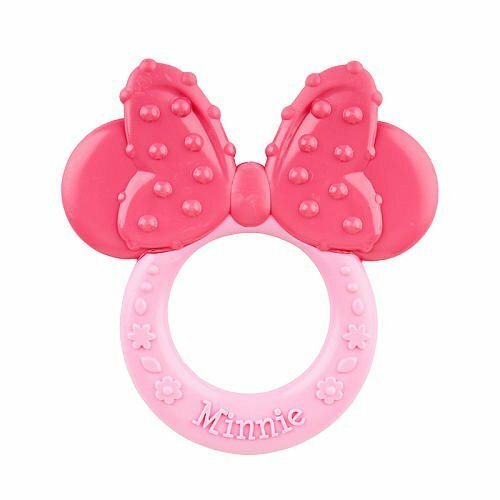 Its circular handle makes it easy for your little one to grasp and the textured mouse ears are perfect for chewing. Is silicone teether safe for baby? Yes, teethers made out of silicone are safe baby teethers. You can also use wooden teethers, like this Maple Teeth Pair, and natural fabrics. However, some wooden teethers might be dangerous and splinter. Buy only from a reputable company. We recommend you watch out for teethers made out of plastic, as plastic can contain a number of dangerous chemicals such as BPA, phthalates, and PVC. 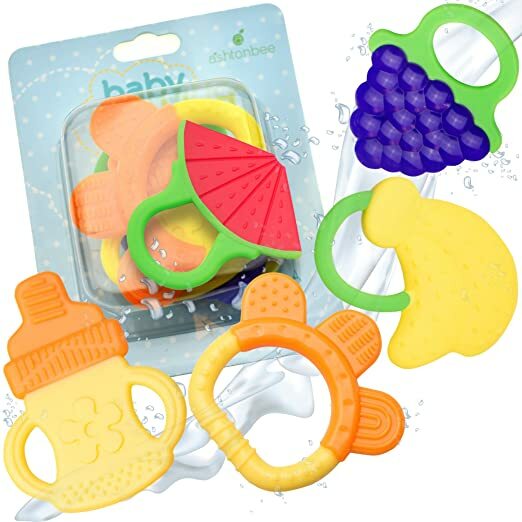 Whether you are looking for the best teething toys for 4 month old or 6 month old, you can use buy any of the ones above. Most of these teething toy manufacturers recommend that your baby is at least 3 months old. For more toys, check out the best toys 2019. 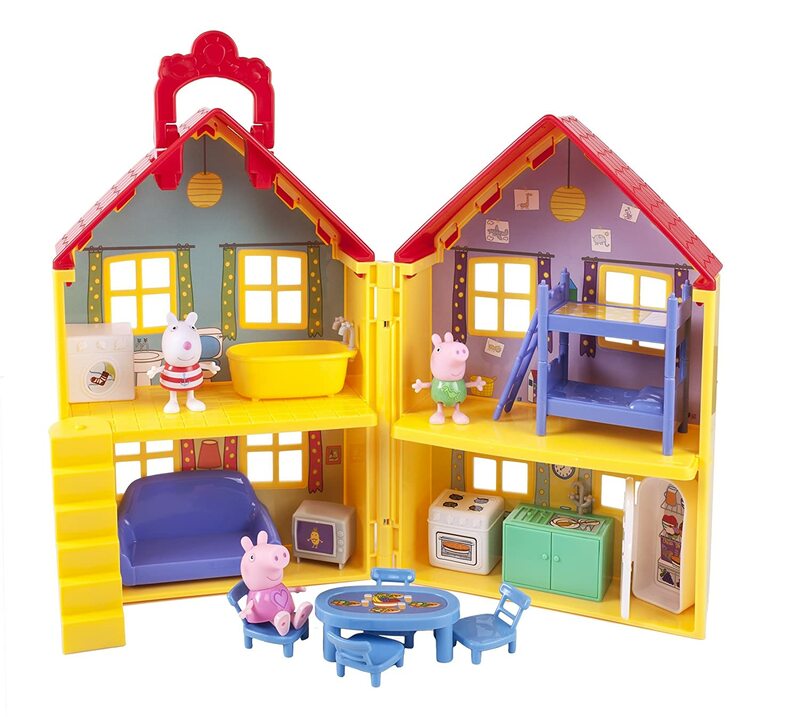 This entry was posted in Toys on November 14, 2018 by admin. 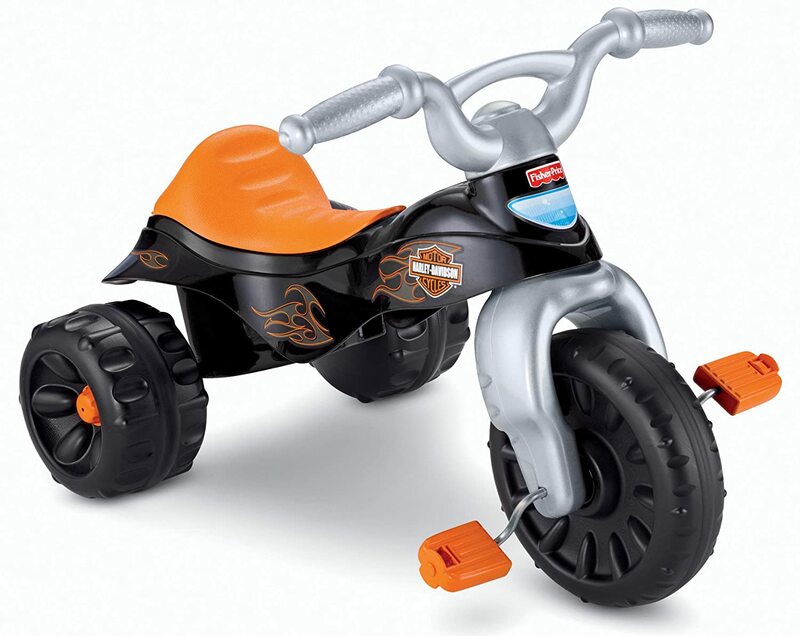 The below is a list of top toys, which are highly rated by parents. These toys make great gift, whether you are getting them for a birthday, Christmas, or just out of love. 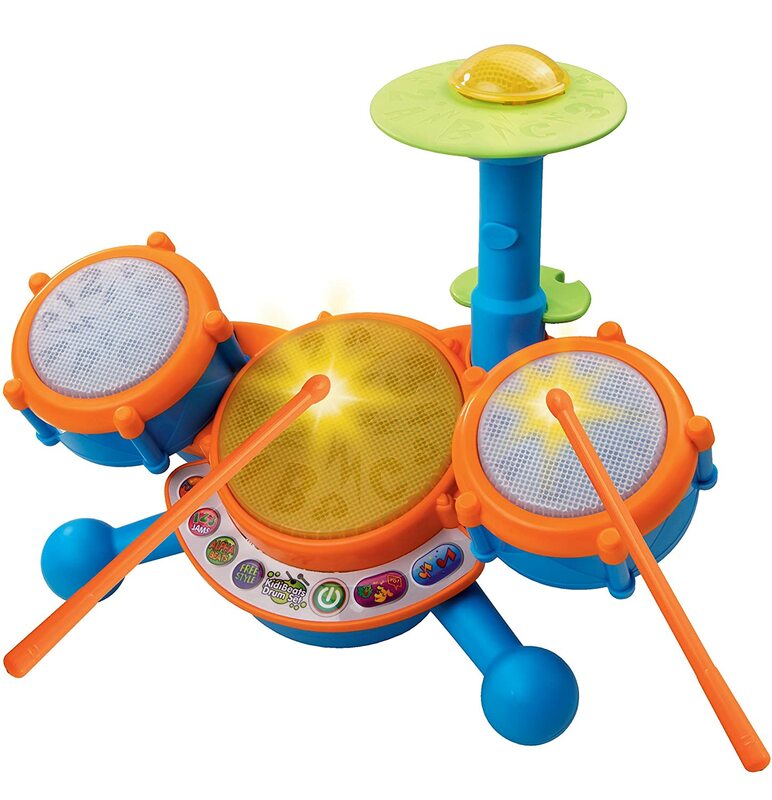 VTech Drum set includes 3 drum pads and cymbal, each with its own unique sound for sensory development. There are 2 drumsticks so that your child can feel like a real drummer. Toddlers can play along to 9 melodies, including rock, dance and pop. There are 4 modes of play: Free Play, Letters, Numbers, and Follow-Along. 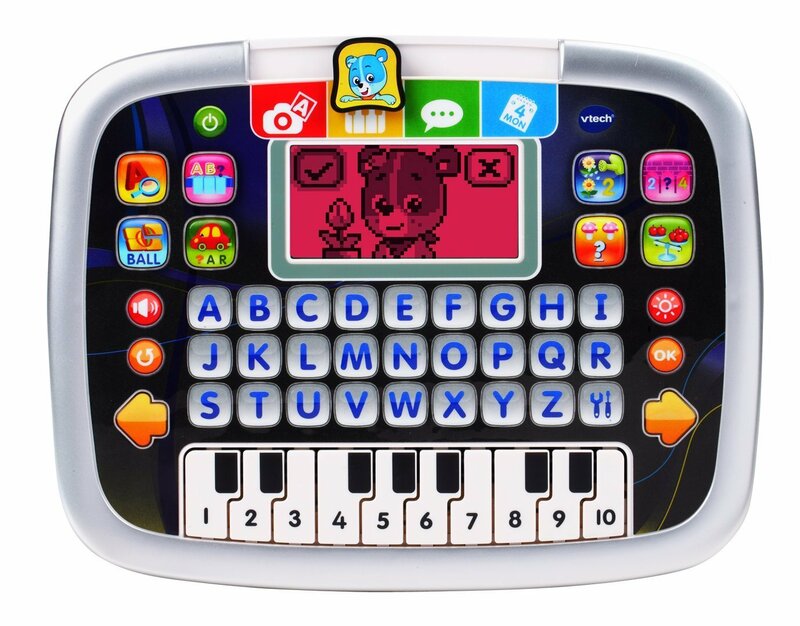 These modes teach children letters, numbers, and music. Each drum features an unique LED light. Want to introduce your kid to the game of baseball? 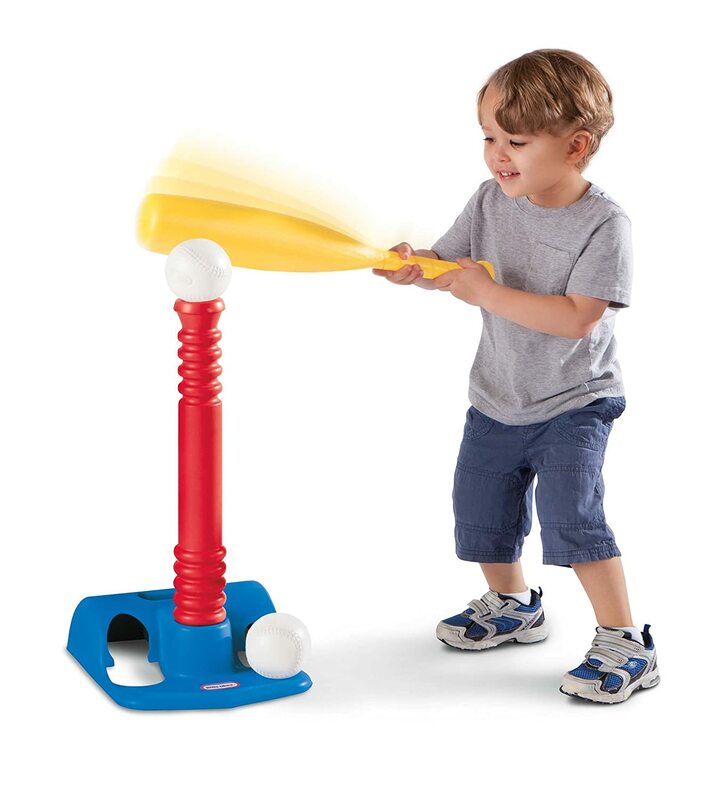 This kids baseball set is perfect for beginning batters. It helps to improve your little one’s batting skills, motor skills, and coordination. 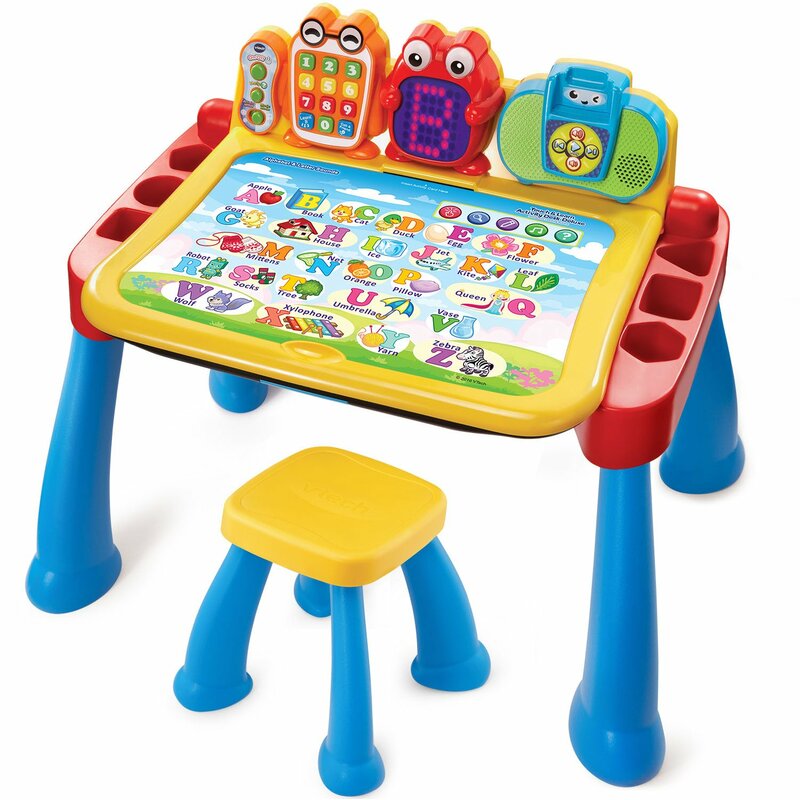 The adjustable height “T” adapts to a child’s developing skills. Both the bat and baseball are oversized so that it is easy for toddlers to make contact and practice their swing. Children can play by themselves or with others. The bats and balls can easily be stored in the base of the set. There is also a special “hang on the wall” design for easy storage. 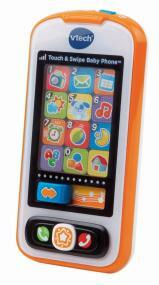 VTech Touch & Swipe touch screen baby phone features 12 light-up pretend apps to encourage your child to touch and play. Apps include pretend calendar, clock, and weather. Switch between the app screen and the music mode, which features 15 fun melodies and sing-along songs to keep kids engaged. The songs help teach toddlers the alphabet, numbers, and first words. 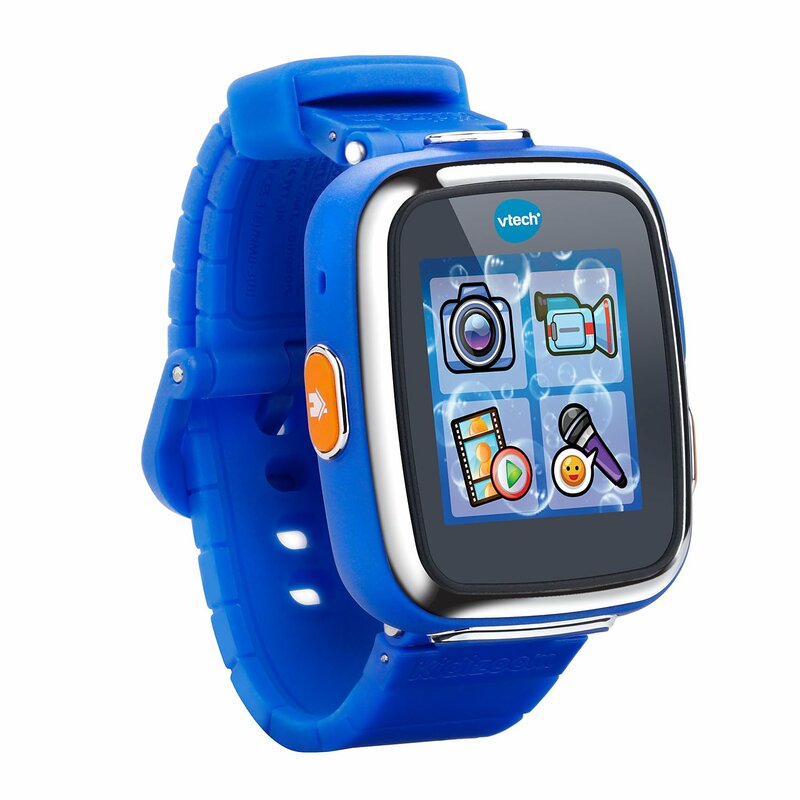 This baby phone encourages hand-eye coordination and role-play as they use pretend apps to call home, check the weather, and organize their day. 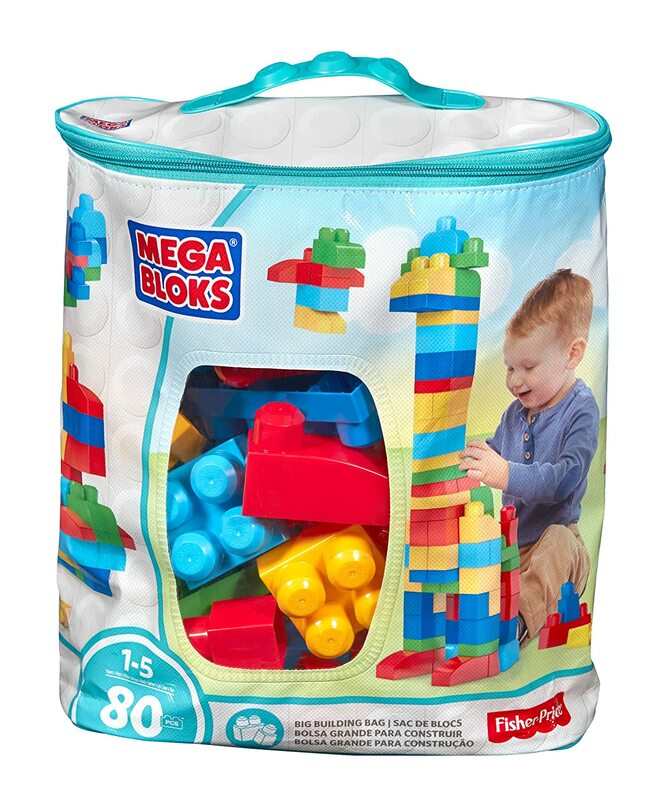 Designed especially for toddlers, Mega Bloks First Builders blocks are easy to hold, stack, and take apart. This pack has 80 large building blocks, perfect for your little one to engage in hours of open-ended creative play. These blocks encourage hands-on exploration as children use their imagination and creativity to build anything they can dream up. 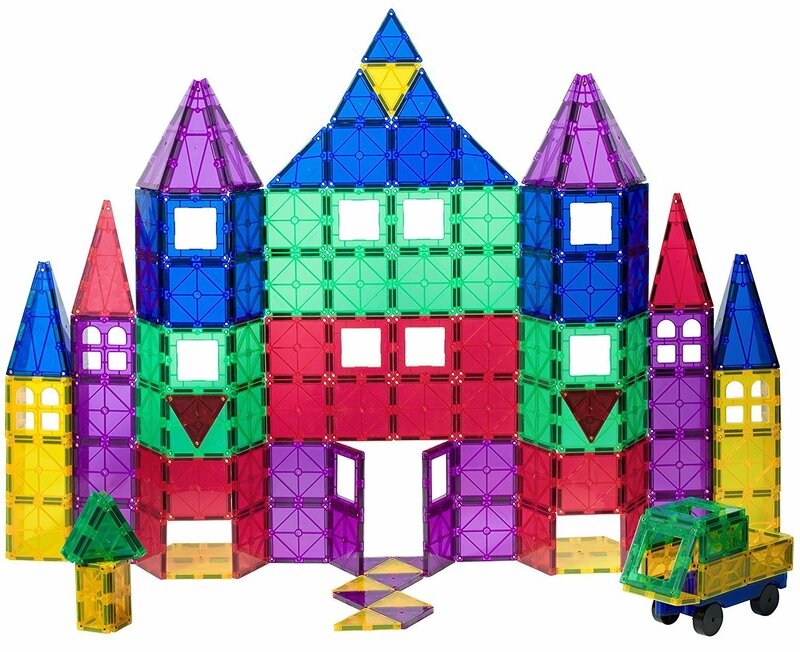 Mega Bloks helps with physical, cognitive, and social development. Stimulate your kid’s motor and learning skills while encouraging discovery and role-play. Mega Bloks is available in different color schemes, including classic colors, lighter pastels, and trendy bright colors. This original one appeals to both girls and boys. It comes with a storage bag to make clean-up easier and a hand-strap so that you can carry the blocks with you on the go! 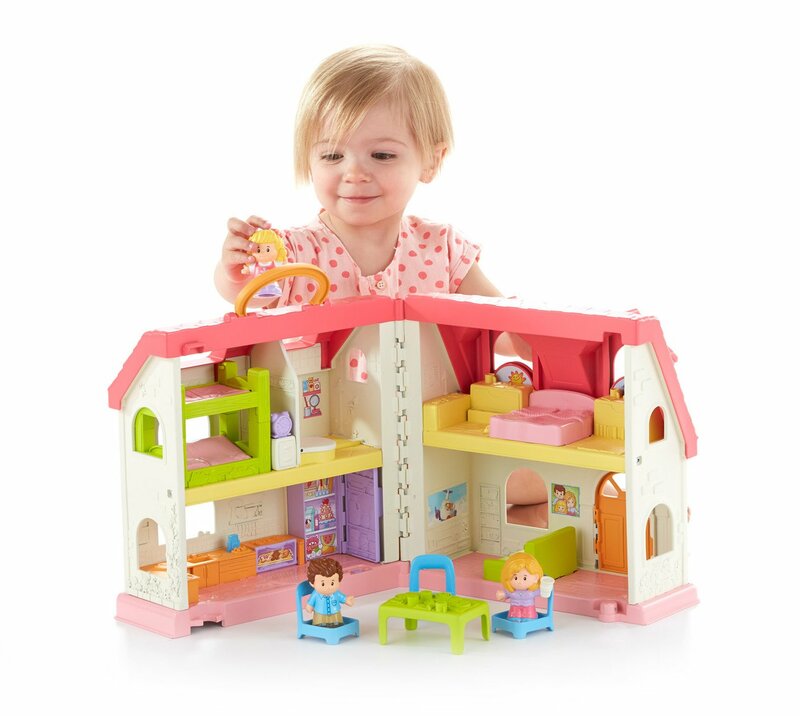 With Fisher-Price Little People playhouse, kids can touch, sing, and listen. There are 50+ sounds, songs and phrases. Children can use their imagination and creativity to create their own little world. 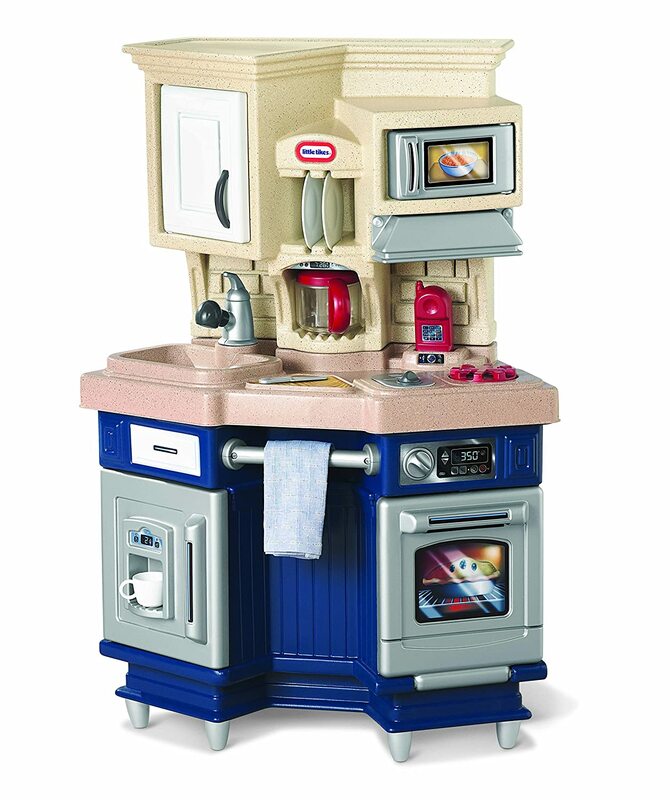 By grabbing the figures, opening and close the oven or fridge doors, kids can discover and learn about everything around the house while developing their motor skills. There’s an alarm clock that tells them it’s time to get out of bed, a toilet that flushes and instructs them to wash their hands, a fridge that opens and tells them the color of an apple, a music player that invites them to dance, and many more! Everything stores inside the house so you can close up the house for an easy clean up. Grab the handle and take the house with you on the go. 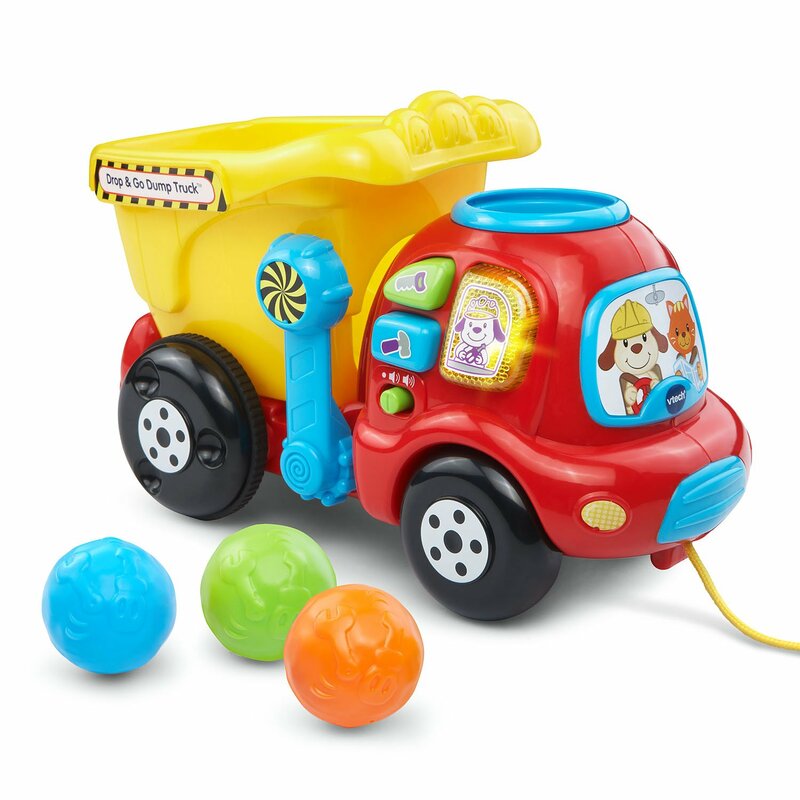 VTech Drop and Go Dump Truck includes 3 colorful buttons that play melodies, phrases, and teach tools and colors. Learn numbers by dropping colorful rocks into the top of the dump truck and watch them tumble into the bucket. Your little one can count along with the interactive truck as it counts each rock. Then, push or pull the truck along to see the rocks rumble inside the bucket. This truck also helps kids develop motor skills as they lift the hinged buccket to unload the rocks and start again. 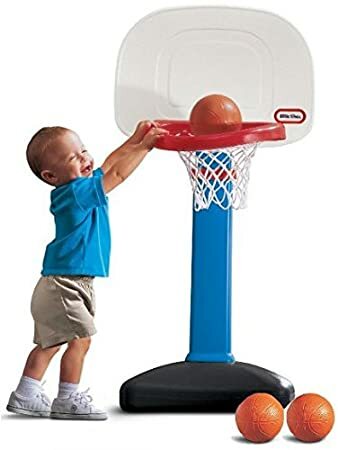 This makes a great early education toy for toddlers. 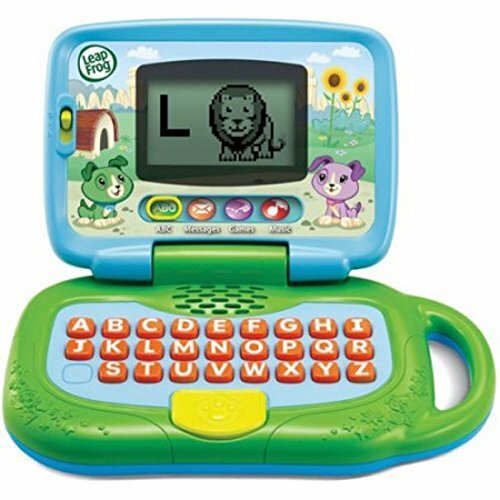 This entry was posted in Toys on December 26, 2017 by admin.